Farrell was the head professional at Baltusrol Golf Club for 33 years, beginning in 1934, and one of the leading pros of his era, winning 21 PGA events. Farrell, who won the U.S. Open in 1928 when he beat Bobby Jones by one shot in a 36-hole playoff, played in the first Masters tournament and was on the PGA Tour from 1919 until the mid-1930's. He finished second in the U.S. Open twice, second in the PGA Championship twice and second in the British Open once. He won the 1936 New Jersey State Open. Starting in the spring of 1927, he won eight consecutive PGA Tour events, a run that was unequalled until Byron Nelson won 11 in a row in 1945. 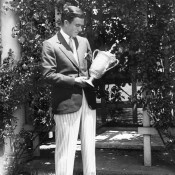 Farrell was voted Best Golf Professional in the United States in 1927 and ’28. He played for the United States in the first three Ryder Cups: 1927, 1929, and 1931. He taught golf to Presidents Eisenhower, Kennedy, Nixon and Ford, as well as Bing Crosby, Bob Hope, Douglas Fairbanks, and the Duke of Windsor.